Critics say the outlook is far from certain for cash-strapped, overburdened providers expected to do more with less. 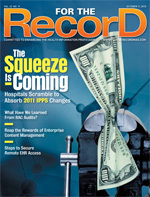 Facing a 2.9% payment reduction and an expansion in the number of quality measures included in the Reporting Hospital Quality Data for Annual Payment Update (RHQDAPU) program, hospitals are scrambling to find ways to do more with far less in the wake of the issuance of the 2011 inpatient prospective payment system (IPPS) rules and policies. The rules, issued in August by the Centers for Medicare & Medicaid Services (CMS), will decrease overall operating payments to acute and long-term care hospitals paid under the IPPS by an estimated average of 0.4% ($440 million) in 2011. Capital payments are expected to decrease by 0.5%, or $21 million. Those reductions include an initial market basket increase for inflation of 2.6%, reduced by 0.25% to 2.35% as mandated by the Patient Protection and Affordable Care Act for those facilities that submit quality measures data. It also increases by 12 the number of measures hospitals must submit under the RHQDAPU program for 2011, 10 of which will be used to determine a facility’s 2012 update and two of which will be used to set the 2013 update. Among the new measures are rates of occurrence for eight categories of conditions subject to the hospital-acquired conditions policy. It also retires one measure, mortality for selected surgical procedures (composite). Hospitals successfully reporting RHQDAPU quality measures will receive the full 2.35% market basket update. Those that do not participate in the program will see their market basket update decreased by 2%. The most controversial change for 2011, which also factors into the 0.4% average estimated reduction, is the 2.9% payment cut. That takes the form of documentation and coding offset designed to recoup 2008-2009 Medicare spending that the CMS says resulted from hospital coding practices that did not accurately reflect case mix changes. Childs notes that the 2.9% cut for 2011 is just the beginning. In all, the CMS intends to recoup a total adjustment of 5.8% to recover all excess payments for fiscal years 2008 and 2009. • adjust payments to critical access hospitals for outpatient facility and ambulance services. The challenge for most hospitals will be finding new ways to contain costs and invest in the systems necessary to comply with the new mandates, all while caring for higher-acuity patients. It is unlikely that many can accomplish this through changes in coding patterns and behaviors, which are already under scrutiny through recovery audit contractor audits. While it’s unlikely any relief will be found in coding behaviors, hospitals may want to more closely examine high-volume diagnosis-related groups (DRGs) and evaluate how they will be affected by changing weights, according to Joe Thear, vice president of product management-revenue cycle for QuadraMed. He notes that the new fiscal year is expected to bring decreases in the weights applied to several high-volume DRGs, including renal failure, heart failure with shock, and chronic obstructive pulmonary disease. For example, Medicare is decreasing the weight on renal failure by 3%. “The case mix is a huge driver in Medicare payments. … That [3% decrease] can be a significant amount of money. Someone in finance and in HIM should be analyzing the impact to see which high-volume cases should be taken into consideration,” says Thear. “The HIM department and the finance department need to be in lock-step when reviewing the final regulations and the potential impact, not only to see where weights are going down but also to their caseloads to see where they can deliver quality care at lower cost. It really is a conundrum. “It’s easy to say that there is an overall market basket increase, but when you take out the coding adjustment impact and other [changes], hospitals are very nervous,” he adds. In the past, one popular strategy for dealing with inpatient payment reductions was to shift costs to the outpatient side. However, looming changes to the outpatient PPS and the reality that most costs that can be shifted already have been mean this is “not as lucrative an area as it was a decade ago,” says Thear. Therefore, in addition to evaluating case mix and lines of business, hospitals should focus on increasing the quantity and quality of data they collect. This helps ensure they are capturing the quality measures necessary to receive the full market basket update for participating in the RHQDAPU program. It also addresses the shift to a more consumer-centric perspective that focuses more heavily on quality indicators. Some consider the expanded quality measures required for RHQDAPU participation to be more onerous than the payment cuts for three reasons. First, as noted previously, failure to fully participate in the program means even less money—a 2% reduction in the market basket update. Second, many hospitals are not prepared to comply with the expanded reporting requirements. Compounding the problem, many hospitals are focusing IT resources on complying with meaningful use mandates to ensure they are eligible for the incentive funds that will help cover the costs of the new systems and processes necessary to capture more and better quality data. Third, there are many unknowns when it comes to exactly how the CMS wants quality measures to be reported, questions that require answers in time to establish the proper processes by the January 1, 2011, start date. Keaton-Cockrell, who is on the board of directors of the American Academy of Professional Coders (AAPC) Chapter Association and president of the Columbia, Tenn., AAPC chapter, has more questions for the CMS, including how frequently measures on each patient must be reported, what exactly will be reported, and how that reporting will take place. She adds that a major struggle with the revised reporting requirements is the reality that many smaller rural hospitals and critical access hospitals don’t have the necessary financial resources to deploy the systems that will allow them to fully participate. This is especially true with the additional 12 measures that must be reported in 2011. “They can’t even manage the 45. There’s not enough implementation time to do this and get the incentive,” says Keaton-Cockrell. Adding to the complexity of the quality measure change, the CMS has proposed adding hospital-acquired conditions and the two patient safety indicators. Further, based on current information, some measure will be pulled from different quarters. Childs suggests that automation may be the best answer to the expanded reporting requirements, particularly given the proliferation of reporting that is now expected. In addition to the RHQDAPU program, hospitals will soon be required to report on meaningful use measures through their EHR systems. Further, the Centers for Disease Control and Prevention’s National Healthcare Safety Network will require reporting on bloodstream infections beginning in 2011, and penalties for failing to comply with value-based purchasing measures designed to reduce hospital-acquired conditions will face incentive reductions beginning in 2015. “Our overall point of view is that they can streamline this process, reduce the number of chart-extracted measures, and increase the number that can be reported through an automated process. That is where we need to go. What hospitals need to be looking to do is automating these processes,” says Childs. At the same time, however, the CMS should be taking into consideration the magnitude of the burden being placed on hospitals, he adds. From meaningful use to expanded quality measure requirements, hospitals are being asked to design and implement a plethora of new systems and processes in a very limited time frame and with shrinking budgets.